This is a summary of our submission to the Joint Select Committee on Constitutional Recognition Relating to Aboriginal and Torres Strait Islander Peoples. Community Legal Centres NSW and Kingsford Legal Centre strongly support a number of changes relating to constitutional recognition of Aboriginal and Torres Strait Islander Peoples (ATSI). As concluded in the Statement from the Heart (2017), ATSI people call for their recognition in a constitutionally-enshrined voice to parliament, as well as the establishment of a Truth and Justice Commission to oversee agreement-making between government and First Nations. Such changes would build upon the right to self-determination as enshrined in Article 1 of the International Covenant on Civil and Political Rights and allow Indigenous peoples the right to participate in decision-making matters which affect their own rights and to develop their own decision-making institutions. 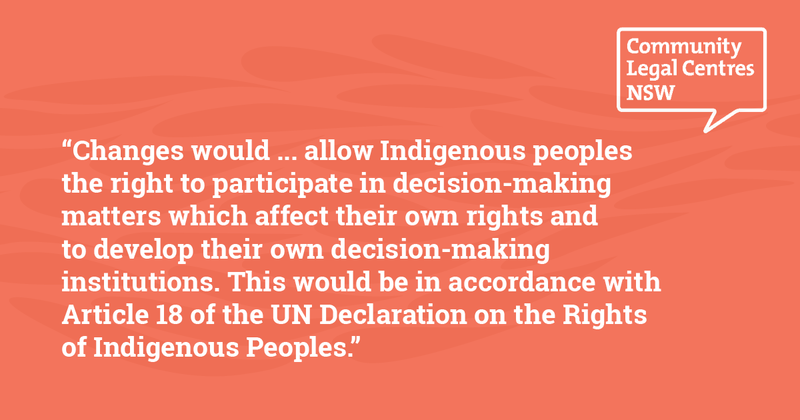 This would be in accordance with Article 18 of the UN Declaration on the Rights of Indigenous Peoples. In order for the Statement of the Heart to be recognised, and for ATSI people to exercise their right to self-determination, the following recommendations should be implemented. The Government should support Voice, Treaty, Truth, as articulated in the Statement from the Heart and the Referendum Council’s recommendations. All recommendations for constitutional reform should respect Aboriginal and Torres Strait Islander peoples’ right to self-determination. A referendum should be held to constitutionally enshrine a First Nations Voice to parliament. Enabling legislation for the design, composition and operation of the First Nations Voice should be co-designed between parliament and Aboriginal and Torres Strait Islander people, after extensive community-led consultation. Enabling legislation for the First Nations Voice should be accompanied by appropriations to adequately fund the First Nations Voice so it can perform its required functions and to ensure its efficient and ongoing operation. A Treaty Commission should be established to supervise the agreement-making process between government and First Nation parties and to facilitate truth-telling processes. Legislation to establish a Treaty Commission should be developed in extensive consultation and co-design with Aboriginal and Torres Strait Islander people and organisations. Such legislation should be accompanied by appropriations to adequately fund a Treaty Commission to perform the functions of supervising agreement-making between government and First Nation parties and facilitating truth-telling processes. You can view our full submission here.